GRITFit Knee Wrap pair is a knee compression sleeve used for Squats, Powerlifting, Weightlifting, CrossFit, and workouts- Compression & Elastic Support 72" For Men & Women - Bonus: 3 Free Workouts and a carry bag! 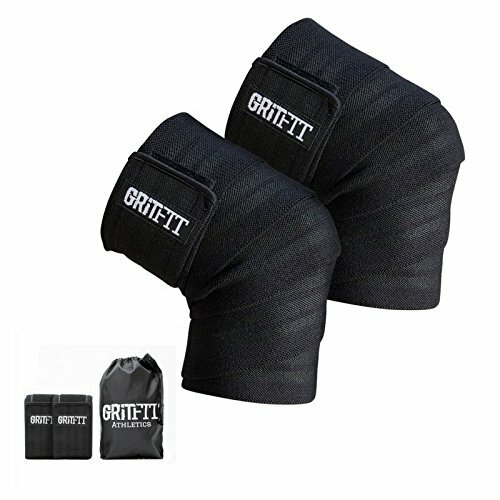 • GRITFit Powerlifting Knee Wraps are made from Heavy duty elastic, stretchable high performance sports fabric with adjustable hook and loop closure. Unparalleled knee strap. SOLD AS A PAIR comes with a Free GRITFit Carry Bag included! THE SUPPORT, STRENGTH, AND STABILITY YOUR KNEES ARE CRAVING - Whether you're panting on the squat rack for that final rep, powering through the last leg press, or even working the cross-fit circuit, these GRITFIT knee wraps will become your invaluable companion. Crafted and designed from high-quality, secure elastic with extra padding to give your knees the strength, stability, and control it craves. Securing your absolute safety. That's what our knee straps strive to give you! INCORPORATED NON-SLIP VELCRO STRIP, SO YOU CAN ADJUST TO YOUR DESIRED GRIP - Our built in velcro strips stretch and squeeze to fit around your knees! So you can tweak, twist and adjust these compression knee braces to fit smoothly around you. Made with stretchable high quality elastic, so it can expand and extend to your very needs! So whether you like a tight fit strengthened grip, or a gentle smooth wrap, these knee compression sleeves will be right there with you, every STRETCH of the way! NON-SLIP, SO YOU CAN TRAIN WITHOUT A GLITCH! Never have to stop your workouts to re-roll your wraps again! Whether you're squatting, powerlifting, or sweating for that extra kettlebell swing, the last thing you need is to keep re-rolling your knee wraps. Our powerlifting knee wraps are specially formulated to never slip, slide, or roll off while training. So you can stay laser focused on your workouts, distraction free, hassle free! A COMPLETE 72 INCHES, TO GIVE YOU AS TIGHT OR A GENTLE GRIP AS YOU SO NEED! Made with 72" inches of stretchable high-performance elastic fiber. So whatever the size of your knees, or length of your legs, these GRITFIT knee straps will provide you the ultimate one size fits all solution. Whats more? Our high-quality fiber material ensures it lasts through the long stretch, for you. So you can sweat and steam through your workouts, day in, day out, without a worry in the world! ADDED BONUS- CARRY BAG & 3 FREE WORKOUTS: Every GRITFIT Knee wrap purchase comes with a carry on bag to hold your compression knee sleeve separate from your gym equipment. Not sure how to use our knee wraps? Includes a complimentary pdf with three body-busting workout routines to boost your workouts to another level! What's more, you get our hassle free money back guarantee, so there's absolutely no risk to you! Make GRITFIT the very first and last knee compression straps you will ever need! If you have any questions about this product by GRITFIT Athletics, contact us by completing and submitting the form below. If you are looking for a specif part number, please include it with your message.